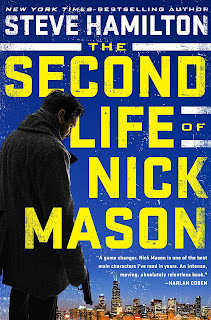 If you haven’t noticed already, my latest Mysteries and Thrillers column—posted earlier this morning on the Kirkus Reviews Web site—features an interview with Steve Hamilton, author of both the long-running Alex McKnight detective series (Die a Stranger, Let It Burn) and the soon-forthcoming thriller, The Second Life of Nick Mason (Putnam). I’ve followed Hamilton’s work ever since his early days with the McKnight novels, back when I commissioned Anthony Rainone to interview him for January Magazine. We have since met at a few Bouchercons, including last year’s event in Raleigh, North Carolina, and I’ve found him to be generous with his time and remarkably humble for somebody who’s enjoyed his level of authorial success. So it was a real treat to fire off my own questions to this now 55-year-old resident of Cottekill, New York. As if often the case, however, I didn’t have enough room in that Kirkus piece to fit our full exchange. So I am embedding the remainder below. Here, Hamilton talks about his former day-job, his appreciation for cars, his approach to character development in the Mason series, and a great deal more. J. Kingston Pierce: At what point did you finally give up your day-job as a technical writer with IBM and become a full-time author? How many years did you work for IBM? Steve Hamilton: I worked for IBM for 32 years, writing in the evenings when I got home from work, after spending time with my family. It was honestly exhausting, but being a writer is what I always wanted to do. It felt like I was leading a double life, especially as I started having some success (winning two Edgars, putting two books on the New York Times bestseller list, writing two New York Times Notable Books of the Year). When the people I was working with were going on vacation with their families, I was going on book tours. So I can’t tell you how happy I am to finally be in a position where I can concentrate on writing full-time. I know I’m very lucky, and I’ll never take it for granted. JKP: In The Second Life of Nick Mason, your protagonist has the opportunity to wheel around Chicago in a couple of classic cars, first a 1968 Mustang, then a 1967 Camaro. You write rather lovingly of both experiences. Are you a vintage-car enthusiast? SH: I grew up in Detroit, so cars are in my blood. Even now, you go back there on a Saturday night in the summer, and you’ll see all of the old classic cars doing the “Telegraph Cruise.” The Ford Motor Company, in particular, has been a big part of my extended family. My father worked briefly for Lee Iacocca back in the1960s, when I was just a little kid, and his job was to distribute this new car called the Mustang to all of the local dealerships. As you can imagine, he got to be a pretty popular guy. JKP: One of the few complaints I’ve heard about Second Life is that not all of the main players are given great dimension. Is that because you looked at this book as the opening chapter in a longer saga, one that will give you time over its full run to flesh out your continuing characters, including the enigmatic pet shop owner, Lauren, and Mason’s daughter, Adriana? How much do you think series characters need to be developed in the early books to keep readers interested? SH: I wanted this book to be lean and fast, but at the same time I think all of the essential information about these characters is there. You’re right, it is the first book in a series—I’m on number 11 with Alex McKnight, so I’ve learned a lot about how a series should develop. In Nick Mason’s case, I’ve been much more thoughtful upfront about where the series is going. I actually have the first seven books all plotted out in great detail, so I can tell you that readers will learn a lot more about these characters as the series progresses. Every character will have his or her own time, with much more depth and history. And some of the transformations will be pretty dramatic. Allies will become enemies, and enemies will become allies. JKP: By the way, does Lauren have a last name yet? I don’t remember seeing it mentioned anywhere in your new novel. JKP: Does it have any influence on your writing this new series, knowing that Lionsgate hopes to use your books as the basis for a film franchise? Do you deliberately introduce elements into your stories that might play out well cinematically? SH: That deal came about months after the first book was completed, but even with the second book, it’s not something I ever consciously think about. Of course, there’s always a certain amount of visualization that goes on in a writer’s head when he’s writing a scene. Many of the same elements that make a scene work on paper, when the “film” is essentially playing in the reader’s head, will naturally translate to a real-life film adaptation. But you can never let yourself get too hung up on that. Your job as a writer is to tell the story, in the best way you can. That’s it. JKP: I notice that you have two children, Nicholas and Antonia, both of whose names you use in Second Life—Nick being the first name of your protagonist, and Antonia’s being the name of the Rush Street restaurant in Chicago where Nick is ostensibly employed. Why was this book the one in which you chose to honor both of your offspring so? SH: Nick was a name that came to me early on—it just had the right feel to it, for a character like this. Nick Mason. It just fits him. I’ve always loved that name, even before I had a son and named him Nicholas. For Antonia, I think it was just a matter of giving her a little equal time. JKP: After all your years of writing fiction, after all your accomplishments in the field, what’s one thing you know now that you wish you’d understood from the very start? SH: Honestly, I wish I’d known that a publisher is not doing you a big favor by publishing your book. It should be an equal relationship, and promises should be kept on both sides. If it’s not working for you, you should be free to leave. A pretty simple idea, I know, but I wish someone had told me that a long time ago. JKP: And with these two series going, will you ever find time again to write standalones such as Night Work (2007) and The Lock Artist? SH: I’m sure I’ll do that again. Although I’m actually more excited about the chance to go back to Michael (from The Lock Artist) again. As long as he has this unforgivable talent for opening safes, and as long as other people know about it, there will always be new trouble for him to get into. READ MORE: “Writer Steve Hamilton’s Second Chance,” by Richard Turner (The Wall Street Journal). Will be recommending to our mystery-thriller library book group that we read this book and this author. If all of the author's books are as well-done as this one, they are in for a treat. It's one of the best books in this genre I have read for awhile.